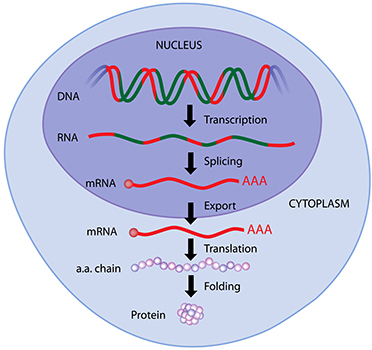 Protein expression occurs in the cell after mRNA has been transcribed from the cell’s DNA, as the mRNA is translated by ribosomes into a polypeptide chain of amino acids. This polypeptide is then potentially modified in post-translational modification steps and then folds, often with the help of chaperone molecules, into its correct conformation. This mechanism creates all proteins used for signaling, immune system functions, and biological structure. Scientists have found a variety of ways to exploit this system in order to produce more or less of a desired protein, or to induce a cell to produce a protein not normally found in that cell. Protein expression systems include mammalian cells such as Chinese Hamster Ovary (CHO), bacterial cells (particularly E. coli), yeast, and insect cells. In addition, hybridoma mammalian cells are another key system for protein expression. These cells are hybrid cells that are produced by fusing normal cells with cells from myeloma tumors; they are characteristically immortal, continuously over-express target proteins (including monoclonal antibodies) and do not enter senescence. The wide variety of expression systems available can be difficult to navigate. Many proteins may not express well outside their original organism, for a variety of reasons including the lack of proper chaperone molecules for folding, differences in codon usage between organisms, absent post-translational modifications in the host organism, and protein solubility differences. These difficulties can be mitigated with selection of the correct host strain, production method, or protein tag. A chart with a rudimentary explanation of the strengths and weaknesses of each expression system can be seen below. The scientists at Western Blot Service are skilled in the selection of the correct cell system for protein expression and aid clients in selecting the best cell line for their needs.